This hotel has a very beautiful and relaxing atmosphere. The rooms are very nice, especially the beds - they are very comfortable with lots of great pillows and down comforters. The staff was also very friendly and very quick to respond to any request I had. Overall, a great hotel. Very nice hotel. Great rooms and fitness area. Easy access to downtown and interstate 65. Parking was difficult to access. This hotel worked out great for us. We would definitely recommend it for anyone attending an event Downtown. It isn't publicized, but if you talk to the concierge for a password you can get free wireless internet access in the lobby area instead of paying for access in the room. Location was perfect for the Kentucky derby mini Marathon. Parking was kind of expensive & the pool was very cold. 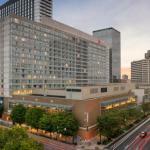 The 616-room Marriott Louisville Downtown is a full-service hotel providing luxury accommodation at an affordable price for both the business traveler and families on vacation. The 17-story, non-smoking hotel has two concierge levels and a pedway connection to the Kentucky International Convention Center and Louisville's new Fourth Street Live district. Items included in the room rate are in-room tea and coffee, local telephone calls and a morning newspaper. There are 30 rooms available for business and social functions. The largest, the Marriott Ballroom can accommodate 3,000 guests. Area landmarks and attractions include Fuzzy Zoeller's Covered Bridge Golf Club, Waterfront Park, Louisville Slugger Museum, Louisville Glassworks, the Muhammad Ali Center and Churchill Downs, home of the Kentucky Derby. All the guestrooms, and 25 suites, have a work desk with high-speed Internet access, Internet browser television with cable movie and news channels, pay-per-view movies, CD player, wet bar, pullout sofa bed, alarm clock, tea and coffee making facilities, iron and ironing board, hairdryer and two-line telephone with voicemail and speakerphone. Video games and players are available for rent. The on-site BLU restaurant serves breakfast, lunch and dinner and room service is available around the clock. The Champions Bar and Grill is open for lunch and dinner and there is a Starbucks Coffee which is open throughout the day with lighter fare. The 24-hour front desk has safe deposit boxes and a list of restaurants that will deliver to the hotel. Other amenities include a concierge desk, indoor swimming pool, whirlpool, fitness center, an ATM, full service business center, coin-operated laundry, valet dry-cleaning, vending machines and a gift shop and newsstand. Former guests say this is a wonderful convention hotel. The service and facilities are excellent and the rooms are spacious, clean and comfortable. Couples who came here for a weekend getaway said the room rates were lower and the dining excellent. Most guests said they will stay here on future visits to Louisville and would recommend this hotel to others. Parking: Yes, there is parking. Self-parking costs $19 per day. Valet parking costs $23 per day.